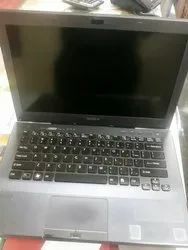 Used Sony Vaio Laptop/ Core I3-3rd/ 4GB Ram/ 500GB/ 14"
Banking on the skills of our qualified team of professionals, we are instrumental in offering supreme quality range of Sony Laptop. E Series features burgundy red accents on its sides, keyboard, and touchpad. Also it has the distinctive wrap design. Live it up with the long battery life and the high quality sound produced by Sony’s "xLOUD" and "Clear Phase" technology.